Blue flowers are restful and lovely in the garden. A blue flower makes a beautiful contrast to bright yelloes and oranges, or when combined with red and white adds a patriotic touch to your plantings. Here are a few tips for creating a beautiful blue flower garden. Choose plants carefully, as you would with any garden plan. Select plants that will grow well with similar requirements for soil, moisture and sunlight. Also select your plants according to height, blooming season and growing habits. Place tall plants in the back of a border, or in the center of a bed that's viewable from all sides. Graduate plant heights from tall to low and ground hugging. 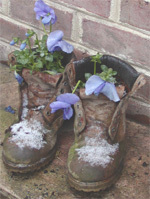 Also consider the time of year your blue flowers will blossom. Try to choose blue flowering plants that bloom in each of the growing seasons for your climate so you'll have a continuous display of lovely blue flowers in your special garden. When decorating your garden with blue flowers, you can add a rich splash of color to your garden. 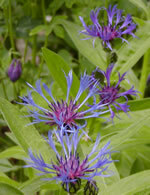 Plant them in a cluster of all blue or mix them in with other flowers for a rainbow of color. The important thing when planting flowers is to follow the instructions on the tag for the plant. Always buy plants that will thrive in the conditions in which you intend to grow them. A plant that loves sun won't do well in a shady area and you will only be disappointed with the results. You must be aware of the bloom time of the flowers when planning you garden. Planting perennials with different bloom times near each other will insure a garden that has blooms all season long. Remember also to plan for the height of the plants, putting the taller ones in the back. Below is a list of favorite blue flowering plants that you might want to consider for your garden. The list is organized by flowering height. Ajuga - Ajuga is sometimes called bugle weed. It creates a mat of green or bronzy leaves with blue flower spikes that rise above the leaves. This spring flowering perennial ground cover grows fast and likes the shade. Vinca, periwinkle - Vinca is tolerant of most soil and sun conditions and is a favorite for mass plantings on banks or under shade trees. Vinca will spread through underground shoots and will form a lovely carpet of shiny dark green oval leaves even under trees. 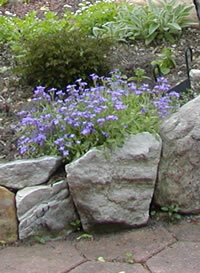 Medium blue flowers appear in mid spring; leaves remain green all winter in most climates. I've had success with vinca in my gardens from southeastern Pennsylvania where it can almost become invasive to gardens in both New Hampshire and Vermont where it's completely hardy and presents a welcome sight in spring after the snow melts. Campanula - Campanula is a low growing sunloving perennial that likes well drained soil. It grows up to 4" tall and will be covered with blue flowers in mid summer. Verbena, blue - Blue purple flowers with yellow centers appear in early spring held about 6 inches over lobed elongated dark green leaves. Dead head the faded flowers and your blue verbena will reward you repeat blossoms again in summer fall. Very hardy and resistant to frost, this low growing perennial is lovely along a walkway, for the front of beds or in a window boxe and planter. I have verbena growing in a sunny spot and also in a partly shaded bed in my Vermont garden. Penstemon, Blue Buckle - Penstemon grows to 15" and prefers well drained soil with full or partial sun. Expect to see tubular shaped blossoms from mid summer to early autumn. Delphinium, Blue Butterfly - Bright blue delicate flowers adorn this tall plant that blooms in early to mid summer. (shown at left, with my husband). The flower stalks rise tall to 18" above the plant base. Prefers excellent drainage, fertile soil and plenty of sun. Needs fertilizing in early spring; may need staking to prevent the heavy flower stalks from falling over. Hydrangea, Blue - Carefree and gorgeous for shade, part sun or full sun so long as it gets good soil, this hydrangea shrub will be covered with big balls of blue flower clusters for most of the summer. Scabiosa - Pincushion plant is a perennial with lavender blue flowers that attract butterflies and hummingbirds. Plant blue flowering scabiosa in a sunny spot and enjoy flowers from early summer through mid fall.